SAP CO Product Costing module is used to find the value of internal cost of products. It is also used for profitability and management accounting for production. The basics of Product Costing is Cost Center Planning. The goal of cost center planning is to plan total dollars and quantities in each Cost Center in a Plant. Use the T-code KP06 and enter the controlling area. 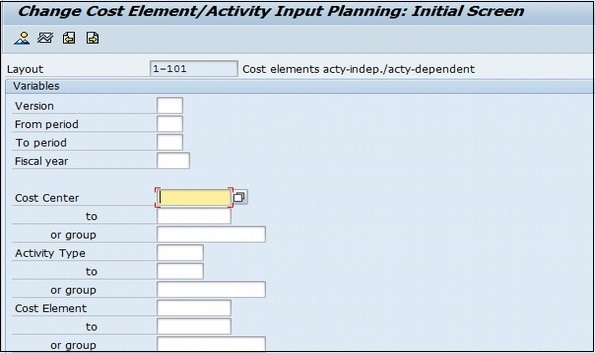 Cost Center dollars are planned by activity Type and cost element. You can also enter the variable and fixed dollar amounts. You can plan all costs in production cost centers where they will end up through allocations, or you can plan costs where they are incurred and use plan assessments and distributions to allocate. To define cost center activity quantities, use the T-code KP26. You can also manually enter an activity rate based on last year’s actual values. Note that if you enter an activity rate instead of using the system to calculate a rate, you lose the opportunity to review actual vs. plan and see dollar and unit variances. It is a best practice to plan activity quantities based on practical installed capacity which accounts for downtime. If you plan at full capacity, plan activity rates will be underestimated. Let’s say we are using Product Costing to value our inventory in a cookie baking shop. This will help us value our cookies (finished good), frosting (semi-finished good), and baking items like eggs, milk, and sugar (raw materials). In order to calculate costs, we need to come up with rates for each activity, such as mixing baking items, oven baking, and cookie cooling. Since a rate is a dollar per unit, we can either come up with a rate based on previous year’s actual rates, or enter our total costs and total units.